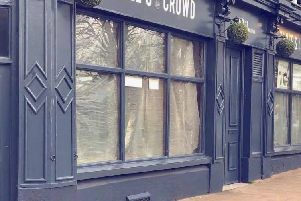 Set in the heart of Malton – now heralding itself as ‘the food capital of Yorkshire – on the banks of the Derwent, The Talbot has under gone a make-over. From bedrooms to bar, to dining to design, the coaching inn has had a make-over. The proof, they say, is in the pudding. So what is the food like? Exceptionally good. A south-facing dining room, which will seat 60, offers views across the River Derwent. Newly appointed head chef Robert Brittain has worked with Sam Pearman to create a series of menus that champion the exceptional produce of Malton and Yorkshire’s wealth of suppliers. After perusing our menus, my mum and I were shown to our table which afforded stunning views across the grounds to the river. The menu reflects the robust meats, delicate fish and the wealth of fruit and vegetables to be had from in and around the town. My mum chose twice baked Cheddar souffle, spinach and grain mustard, £7.50. It was declared soft, light, gooey and tasty. I went for the chopped raw hanger steak with tomato dressing, capers, parsley and croutons, £9.50. It was the first time I had tried raw beef as I wanted to try something new. The tender meat was complimented by crispy croutons and the tomatoes and capers gave the dish a delicious sweet-salty flavour. I followed it up with a venison and claret pie, buttered greens and potatoes, £15. The pie crust was crumbly and the meat tender in a rich sauce. My mum chose whole plaice, new potatoes, buttered spinach and brown shrimps, £16.50. The plaice was cooked perfectly. We both ordered locally-made a selection of Groovy Moo ice-creams. It was smooth and sweet and topped with chocolate sauce. The restaurant has a cosy, cottage feel with antique furniture and floral-patterned furnishings. Herbs grow in planters placed on window sills. At the same time it is sophisticated dining served by polite and attentive staff. Pudding proofed - I think.